Eating healthy at home is one thing ... eating healthy when on the road is a different story. Without proper preparation it can be a nightmare trying to eat healthy when you are traveling. The good news is that, with a little effort and time spent on preparation you can enjoy your entire trip while eating only the best foods. I recently embarked on a plane trip across the planet - several hours on planes, waiting in airports and in cars (Click here to read why I travel). A few days before leaving our home I started to prepare and gather the foods that I wanted to ingest while we would be travelling. I have done a lot of travelling in my life and I know, firsthand, what is available for purchase in airports. I have done several trips where I didn't plan ahead and I was left surrounded by unhealthy options when hungry. Eating unhealthy junk food while traveling only helps in aggravating jet lag, exhaustion, constipation and irritability. Hardly the way I want to experience the wonders of traveling around our globe. At this moment, I am writing this from our destination in Asia and, after completing 2 days of airplanes and layovers, I can tell you that it was a wonderful trip full of vibrant energy and lots of smiles. I know that the healthy and nutrient rich foods that I consumed along the way helped this to be so. 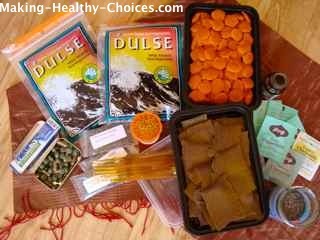 DULSE SEAWEED: Has a great salty taste and travels very well in a zip lock bag. Also a perfect food for combatting the effects of radiation from all those airport scanners and the airplane journey itself. COCONUT JERKY (aka raw bacon): These little pieces of jerky are perfect to satisfy a snacky craving. They are salty, a little sweet and spicy and so easy to travel with. Check out the other recipes on this page too! NORI WRAPS: These are really great savory and satisfying little snacks. Nori seaweed is also great for protection against radiation when travelling. 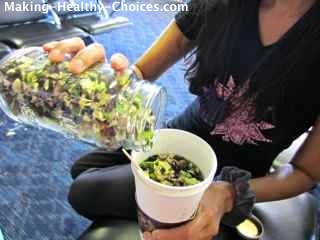 INSTANT VEGETABLE SOUP MIX: This is a very versatile recipe that can provide you with an instant cup of hot healthy soup while on the go (most airplanes or rest stops can provide you with hot water). This mix can also be snacked on dry as a great tasting crunchy snack - so much better than the pretzel packets they give out on the plane. There is quite a conversation happening on Facebook about this soup mix; check it out by clicking here. CAULIFLOWER CRUNCHIES and EGGPLANT CRUNCHIES: These little crunchy snacks are so nice to snack on and very easy to travel with. You can also add them in to the instant vegetable soup mix listed above. SPICY CHEESE WAFERS: These are an all raw, vegan snack that are so tasty and satisfying. Click the link to see the full recipe on how to prepare these at home before your trip. VEGETABLE FLAX CRACKERS: These are also raw and vegan. 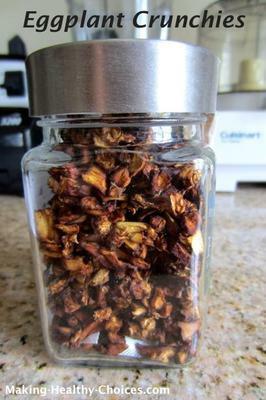 A great crunchy snack to enjoy on its own or to be used with the the SPICY CHEESE WAFERS and the DULSE to make a perfect little cracker sandwich. Click the link to see more on how to prepare these at home before leaving. perfect for staying hydrated on those airplanes. (they are also a great source of fiber, which really helps to keep things moving, helping to avoid traveler's constipation) Click the link to learn more about the benefits of chia. GREEN POWDER & SPIRULINA CAPSULES: It is next to impossible to get a fresh green drink while traveling but no need to go without. Bring a good quality green powder (I highly recommend Vitamineral Green) and mix it with water. Spirulina capsules are a great way to give your body some extra green! CHLORELLA TABLETS and CAMU CAMU CAPSULES: Chlorella is an algae that is highly nutritious and great at protecting from the effects of radiation. Camu Camu is one of the best food sources of vitamin C - always good to have extra vitamin C when travelling. BEE POLLEN and HONEY STIX: If you choose to ingest bee products, always obtain them from a kind and sustainable source. Bee pollen is a great source of amino acids, it travels well and is easy to snack on while on a plane or waiting around in airports. It taste great too. Honey provides that sweetness that is so comforting when on the road and has so so many nutritional and protective properties to keep us energized. This 'stick' form of honey is so easy to travel with and is in small enough quantities to not trigger security issues. HERBAL TEA BAGS: Bring a variety of organic herbal teas with you. Anywhere you can get a hot water is anywhere you can enjoy the soothing and uplifting effects of these herbs. All of the above foods will boost your immune system, energize your cells and keep you balanced and vibrant while traveling... and will help with avoiding intense jet lag. All of these foods are highly nutritious and protective to our systems. Who couldn't use more of that - especially when having a long day of airplane travel? Another thing to do is to call your airline ahead of time (at least 72 hours) and request a special meal. Nowadays they have a multitude of options to pick from. On this trip we enjoyed the vegetarian, vegan, Oriental vegetarian and Indian vegetarian options. My meals were always delivered to my seat before anyone else's and they looked SO much better that what the others were eating. During this trip I ate the healthiest parts of the meal on my tray (leaving behind the packaged cookies and bread) and supplemented the meal with the snacks I brought from home. I slept well on the plane, felt focused and energized when I was awake and had great bowel movements during the entire trip (okay, that might be too much information for some of you but the reality is that this makes the world of difference in how good you feel during and after your long day of travel). Being in such a good space while traveling means so much to me. It allows me to fully experience the absolute joy, love and gratitude I have for being able to experience so many different places on our beautiful planet. It allows me to connect deeply and authentically with those I may meet and to do the same with the unique places and circumstances that cross my path. Please share below any comments/questions you have or things that you do to make traveling more enjoyable. This couldn't be more timely! We're headed to Peru, which would normally not be too long a flight, but the direct flight is too expensive, so we're off on a 14 hour trip (after 2 hours to get to the airport) and then another 2 hour flight, plus an hour on a bus. Can't wait to eat good stuff and arrive energized! And thanks for the reminder about booking the meal early - that will make a huge difference! Thanks for sharing these great ideas for healthy food whilst travelling. I travel a lot and anything that helps to stave off jet lag is a good thing. Especially when I am traveling for business and need to be focused from the moment I land. Always looking for tips on how to do this better, appreciate these suggestions. Thank You! I accompanied Nadia while traveling to Asia and those snacks were awesome. It is great to have some tasty snacks on you while traveling plus the fact that everything you buy in the airport costs an arm and a leg. Excellent snacks.